The 10 passengers and crewmembers who were hospitalized in New York City after arriving sick on a flight from Dubai appear to have the flu. New York City health officials say they obtained respiratory samples from the patients and their symptoms look like influenza. They say they won’t know for sure until they get final results. All of the patients were listed in stable condition. The Emirates flight was quarantined after landing a Kennedy Airport Wednesday morning. The U.S. Centers for Disease Control and Prevention says about 100 of the 520 people aboard the plane had complained of illness, including cough and fever. An airliner from Dubai with 10 passengers and crew members who were hospitalized with flu-like symptoms was carrying 1990s rapper Vanilla Ice. A manager for the rapper confirmed on Wednesday that he was on the Emirates flight that landed at New York’s Kennedy Airport. Fire officials say 10 of the people who arrived sick to New York City on a flight from Dubai have been taken to a hospital. Emirates airline says they included seven crew members and three passengers. The plane was quarantined Wednesday at Kennedy Airport. Medical workers in masks and gloves took passengers’ temperatures on the tarmac while evaluating them. News helicopters showed the jet sitting on the tarmac surrounded by ambulances, vehicles and airport personnel. A plane was quarantined at New York’s Kennedy Airport amid reports of numerous ill passengers aboard a flight from Dubai. The U.S. Centers for Disease Control and Prevention says about 100 of the 520 people aboard the plane were being evaluated after complaining of illness, including cough and fever. A plane has been quarantined at New York’s Kennedy Airport when about 10 passengers became ill aboard a flight from Dubai. This story has been corrected to delete a reference to an erroneous tweet from the mayor’s spokesman saying the flight stopped in Mecca. A plane has been quarantined at New York’s Kennedy Airport amid reports of ill passengers aboard a flight from Dubai. The New York City mayor’s office says a plane has been quarantined at New York’s Kennedy Airport amid reports of numerous ill passengers aboard a flight from Dubai. The Emirates flight landed around 9:10 a.m. Wednesday. Eric Phillips, a spokesman for Mayor Bill de Blasio, says representatives of the U.S. Centers for Disease Control and Prevention were on the scene. Airline representatives did not immediate respond to an email. 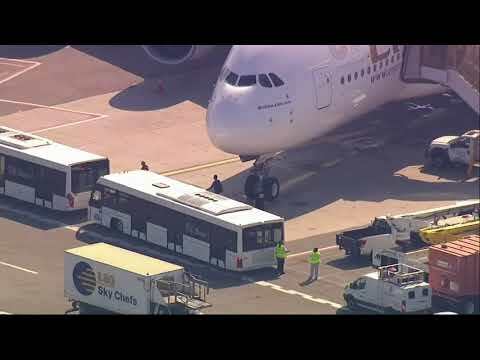 The New York City mayor’s office says a plane has been quarantined amid reports of numerous ill passengers aboard a flight from Dubai that arrived at New York’s Kennedy Airport. The Emirates flight landed at about 9:10 a.m. Wednesday. Video from news helicopters showed the jet sitting on the tarmac surrounded by emergency vehicles and ground control personnel. Airline representatives did not immediate respond to an email requesting information.